Today: June 17, 2009, Tehran, Iran. TEHRAN, Iran – Iranian opposition leader Mir Hossein Mousavi issued a direct challenge Wednesday to the country’s supreme leader and cleric-led system, calling for a mass rally to protest disputed election results and violence against his followers. A crackdown on dissent continued, with more arrests of opposition figures reported, and the country’s most powerful military force _ the Revolutionary Guard _ saying that Iranian Web sites and bloggers must remove any materials that “create tension” or face legal action. In one high-profile display of apparent opposition support, several Iranian soccer players wore green wrist bands _ the color of Mousavi’s campaign _ during a World Cup qualifying match in South Korea that was televised in Iran. EDITOR: Go here and here for live blogging on the Iranian situation. Supreme Leader Ayatollah Ali Khamenei has told Mousavi to pursue his demands through the electoral system and called for Iranians to unite behind their Islamic government, an extraordinary appeal in response to tensions over the presidential vote. But Mousavi appears unwilling to back down, issuing on his Web site a call for a mass demonstration Thursday. Web sites associated with Mousavi and the reformists called for at least one rally later Wednesday but the opposition leader made no reference to the gathering in his official statement. Mousavi and his supporters accuse the government of rigging the June 12 election to declare hard-line President Mahmoud Ahmadinejad the overwhelming winner. 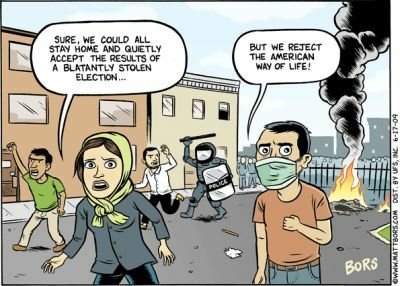 Their street protests, paired with dissent from powerful clerical and political figures, have presented one of the gravest threats to Iran’s complex blend of democracy and religious authority since the system emerged from the 1979 Islamic Revolution. Election tensions appeared to be spreading further into the Iranian political and religious classes _ and into the sports world. Mousavi’s Web site said seven Iranian players wore the green bands on their wrists in the first half of the World Cup qualifier, although most were forced to take them off in the second half. Mehdi Mehdavi-Kia kept his green band on throughout the game, which Iran and South Korea drew 1-1. The violence has left at least seven people dead, according to Iran’s state media, although videos and photos posted by people inside Iran show scenes of violence that have not been reported through official channels. The newly imposed media restrictions make it virtually impossible to independently verify much of the information, which includes dramatic images of street clashes and wounded demonstrators. The semiofficial ISNA news agency and the private ILNA news agency reported that scuffles broke out between two legislators _ one a reformist and the other a hard-liner _ in an open session of parliament after they argued about the election. The agencies said hard-liner Ruhollah Jani Abbaspour attacked reformer Amir Taherkhani after a parliamentary committee probing the protests met Mousavi and the speaker of parliament gave a report on the inquiry. Unlike past student-led demonstrations against the Islamic establishment, Mousavi has the ability to press his case with Iran’s highest authorities and could gain powerful allies. Some influential clerics have expressed concern about possible election irregularities, and a fierce critic of Ahmadinejad, former President Hashemi Rafsanjani, is part of the ruling establishment. Rafsanjani, who was president from 1989-97, also heads the Assembly of Experts, one of the cleric-run bodies that is empowered to choose or dismiss Iran’s supreme leader. Khamenei is Khomeini’s successor, and the assembly has never used its power to remove Iran’s highest authority. The U.S.-based International Campaign for Human Rights in Iran said that several dozen noted figures associated with the reform movement have been arrested, among them politicians, intellectuals, activists and journalists. Tehran-based analyst Saeed Leilaz, who is often quoted by Western media, was arrested Wednesday by plainclothes security officers who came to his home, said his wife, Sepehrnaz Panahi. To try to placate the opposition, the main electoral authority has said it was prepared to conduct a limited recount of ballots at sites where candidates claim irregularities. The recount would be overseen by the Guardian Council, an unelected body of 12 clerics and Islamic law experts close to Khamenei. Mousavi charges the Guardian Council is not neutral and has already indicated it supports Ahmadinejad. He and the two other candidates who ran against Ahmadinejad are calling for an independent investigation. His representative, reformist cleric Ali Akbar Mohtashamipour, said after a meeting with the council Tuesday the number of votes in counted in 70 districts was higher than the population in those districts. He also said many polling stations were closed sooner than scheduled on election night while people were still lining up. On Tuesday, the government organized a large rally in Tehran to show it too can bring supporters into the streets. Speakers urged Iranians to accept the election results. 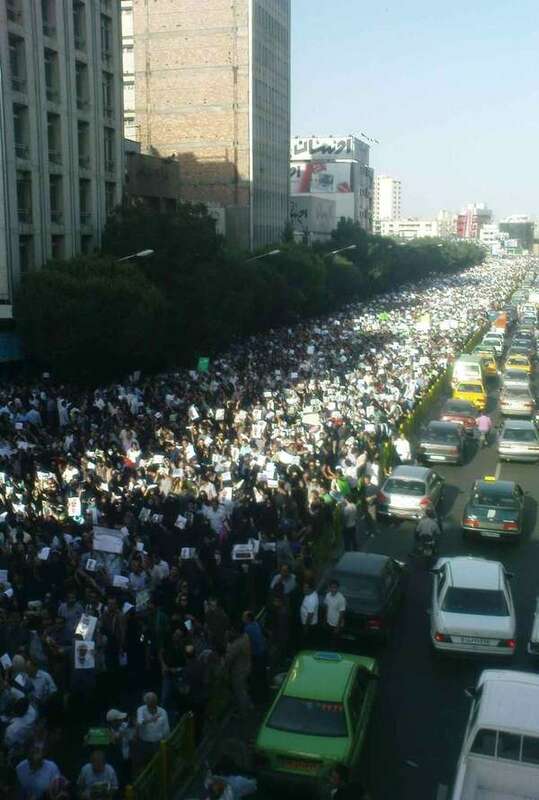 A witness told the AP that the pro-Mousavi rally stretched more than a mile (1.5 kilometers). Security forces did not interfere, the witness said, speaking on condition of anonymity for fear of government reprisal. In Washington, President Barack Obama expressed “deep concerns” about the legitimacy of the election and post-voting crackdowns. Hopefully readers are getting their news about Iran elsewhere and do not need the OB Rag to inform them on this issue. I went to FaceBook and typed “Iran” into the search box and found some pertinent first hand information. I find it interesting and encouraging that a lot of the sign’s that the protesters are carrying are written in English. You have to have respect for these dissidents since the chances of some severe consequences are very real. Notice how many of the have their faces covered. They’ve been living under the thumb of a fanatical theocratic government for too long and it’s finally come to the breaking point. I encourage them to continue and wish them well.